Your single source for quality, verified data on the nation’s pharmacists, including licensure, sanctions, professional credentials, certifications and other advanced practice training. Our streamlined credentials verification is custom-tailored to the needs of pharmacist employers, health plans, PBMs, government and other industry leaders. Our pharmacist-centric service is about much more than licensure and sanctions. You can ensure your pharmacists have the training they need. Here are just a few of the pharmacist advanced credentials we verify with third-party, trusted data. We’ve asked industry stakeholders what is important to them, and we’ve designed our credentials verification solution accordingly. Perhaps most importantly, we know pharmacies and pharmacists. We can help you navigate the changes in pharmacy practice at both the state and federal levels. Let us tailor a solution for you. The Pharmacy Profiles database will be robust, flexible and verified. 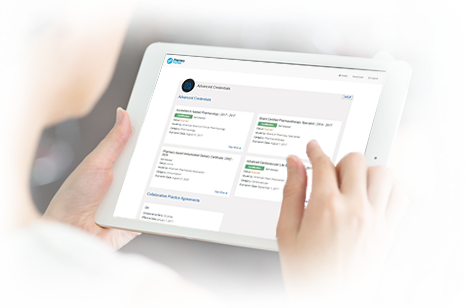 You will be able to customize your access to our intelligent resource of professional pharmacist information based on your specific business, communications or research objectives. Important professional information auto-populated to our Pharmacist Profiles by leading pharmacy organizations – NABP, ACPE, NCPDP and more.